Benefit from of a safe service in Harmondsworth that has gained over 95% of positive client feedback! A: Your panes will be treated by a team of certified and police-checked window cleaning adepts. 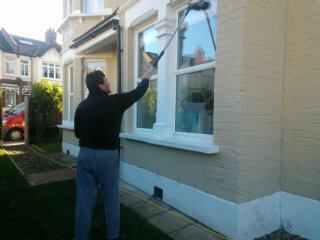 Q: What services does window cleaning Harmondsworth offer? A: The cleaners will perform exterior window cleaning with the help of the latest water-fed pole equipment on the market. For buildings above the fourth storey, we'll dispatch seasoned climbers for rope access window cleaning. For interior pane polish, the team will use standard ladders and squeegees. Q: Can you still dispose of smeared grime on a rainy day? A: A handful of raindrops won't sabotage the Harmondsworth window cleaners' work – rainwater is usually limescale-free. However, if we face a rainstorm, then we will kindly ask you to hold off your booking for another day. A: Yes, any PVC or UPVC frames and sills that your premises features will be treated with no extra charge as part of our service. A: As long as the specialists can pass through your front gate, they can wash away all dirt without you having to be present. If your panes need a proper in-house polish as well, then we'll carry out a quick key pick-up and delivery service. A: Usually, the filtered water container inside the team's washing caravan is always full. In case the tank is empty and with your permission, the cleaners can easily link the water-fed pole to any available water source. Q: Do I need to meet any special prerequisites before the team rings my doorbell? A: Once we inform you that the team's on their way, you'll need to make certain that they can enter your property unimpeded. In addition, the technicians will require a parking slot within 30 metres from your property and on the same side of the windows you want treated. With our window cleaning in Harmondsworth, you get a meticulous wash of your sash windows, skylights, glass roofs, French doors, and other glass surfaces at fair fees. We will even offer a free of charge wash of all PVC & UPVC ledges and frames! For a full list of our prices, please view our price table below. No matter where your smudges have taken shelter, our capable window cleaning in Harmondsworth will repel them with ease. We have encompassed various cleaning methods. Our external window clean is designed for premises with no more than four storeys. To let the sunlight back inside, the window cleaners in Harmondsworth will appear in a caravan, equipped with a stretchable water-fed pole. This equipment is linked to a water tank, filled with purified water. After being released as a powerful gush from the pole's brush-head add-on, the liquid will dissolve all dust build-up in an attempt to regain its natural structure. To access smudgy window corners of multistorey structures, we'll send an established team for rope access window washing. These licensed climbers will employ well-maintained ropes and harnesses or deploy ladders and cherry pickers to renew the allure of your panes. We've got all important COSHH records in place and follow every safety requirement. To make the in-house facet of your window façade just as lustrous, the pros will utilize the usual ladder and sponge washing procedure. In our goal to help as many Londoners as we can manage, we've widened our window cleaning in Harmondsworth to encompass extra areas across the capital. For your comfort, we've listed the names of these nearby locations below. Another quick and easy way to get a free instant quote or to book window cleaning services Harmondsworth UB7 is through our web site.